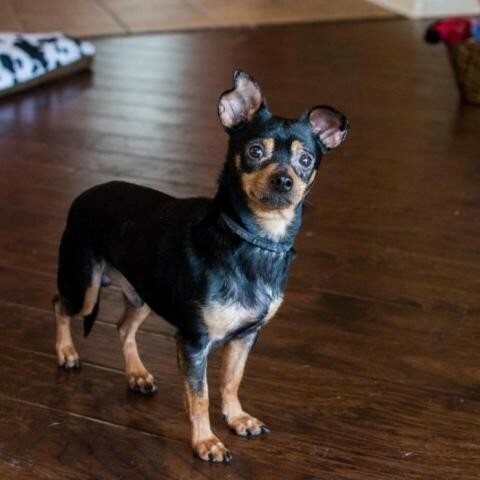 Percy, a 6 and a half year old, 12 lb chihuahua mix, is proof that all lives are worth saving! He was very feral, hovered in the corner with his face buried behind another house mate at the shelter. You probably would not have known he was there if you did not look close enough. Percy had no clue what it was like to encounter normal social interactions with humans or be loved. Since coming into foster care Percy has gone from a scared baby in the corner to going on what was most likely his first walk ever! You can bet it was not as quick as putting a harness on and heading out the door. It was an intentional work in progress meant to help build his confidence. This gave him the confidence he needed join his foster siblings and start learning how to just be a dog. He now goes outside with confidence, is potty trained, uses the doggy door, enjoys sunbathing on the patio, meal time with the pack, playing with the other pups in the house, and so much more! Percy has had many "firsts over the past couple of months. Each one are the result of his hard work. They show how far he has come and how far he can go with a family that will continue working with him. Percy is still learning how to be a dog. He is still shy to sudden movements and is still working on trust. He will come to you and sniff in a calm setting but is not open to being handled yet. Percy is good with dogs; untested with cats but would most likely be fine; older kids would be ok but smaller kids would probably make him too nervous. If you have time and patience, Percy's continuing transformation could be your greatest reward! All Dallas Pets Alive adoptable pets are spayed or neutered, microchipped, and up to date on vaccines upon adoption. The standard minimum donation for dogs over six months to seven years is $200, puppies under six months is $250, dogs eight years and over are $100 unless specified otherwise. You can view all the adoptable pets and fill out an adoption application online on our website at http://dallaspetsalive.org/adopt/adoptable-dogs/ . For more information, you can email adopt@dallaspetsalive.org.